VZAccess Manager v7 (or higher) must be installed, select the appropriate operating system for additional assistance with Installing VZAccess Manager. The information in these examples varies depending upon the device(s) used. From the Windows desktop, navigate: Start > Programs (All Programs) > VZAccess Manager. From the Macintosh desktop, navigate: Finder > Applications > VZAccess Manager. Select the preferred wireless connection then click Connect Wi-Fi. Wireless network connections won't be available without a module installed. If presented with Wi-Fi connection warning, click Continue. 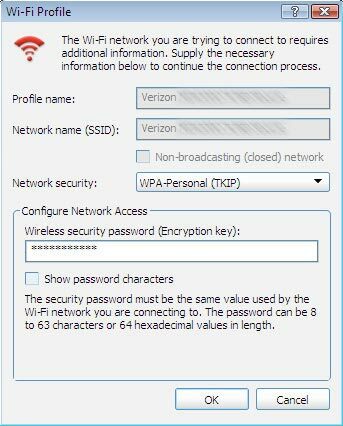 Enter the Wireless Security Password (Encryption Key) then click OK.